This level has medium difficulty. 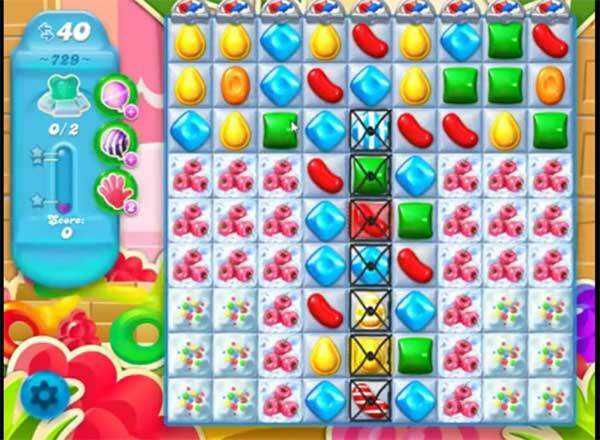 For this level try to play more from the bottom to shuffle the candies and make special candy as you get the chance. Combine them with each other or play near to snow blockers to break them to find the bears. There are only 35 moves allowed now. Wish I had 40. Need help on this level 729 VERY hard to clear all the Blockers don’t have enough moves HELP PLEASE THANKS. iMPOSSIBLE LEVEL READY TO GIVE UP BEEN ON THIS ONE A WEEK NOT EVEN CLOSE CAN ONLY SAVE 1 BEAR NEED MORE SPECIAL CANDIES. Why are there 35 moves, in the video above they only just managed it with 1 move left and they had 40, a couple of times I could have done it with 40, i’ll give it 1 more day and i’m out. Not fair shows 40 moves in the video and I only have 35. I have been on this one for over a month. On the video it has 40 moves on the game it has 40 ,come on this is for for it would be hard for those that are with special needs to ever move up the scale !!! On the video it has 40 moves on the game it has 35,come on this is for for it would be hard for those that are with special needs to ever move up the scale !! !